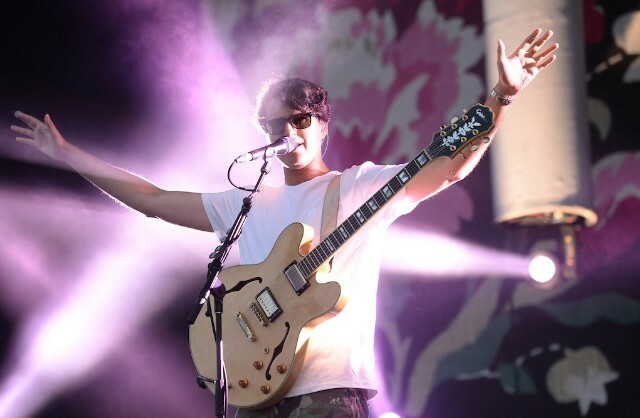 Vampire Weekend have released two new songs from their upcoming album Father of the Bride. “Sunflower” and “Big Blue” are the second pair of singles from the new record, following “Harmony Hall” and “2021,” which came out back in January. The band had planned to release two songs every month until the album drops this spring, but have since revised that plan. According to Ezra Koenig, Sunflower is the “sibling song” of “Flower Moon,” which the band been teasing live for some time. Vampire Weekend have also released a video for “Harmony Hall,” which featured some impressive pancake artistry, as well as cameos from the likes of Dev Hynes, Ariel Rechtshaid, and Jonah Hill, who directed one of the band’s upcoming videos. The band recently announced a lengthy North American tour in support of the new album, which is set to kick off in May. Father of the Bride is due out on May 3, but the band are planning to release at least one more pair of singles before then; Ezra has teased those songs as “tl” and “uw” (past drops had been similarly coded by their first initials). Ezra Koenig will sit down with Zane Lowe on Apple Music’s Beats 1 radio for an interview later today. For now, hear the new singles “Sunflower” and “Big Blue” below.